Stored as a liquid and discharged as a gas, Novec 1230 fluid (FK-5-1-12) is a fluorinated ketone. It distributes uniformly throughout the hazard zone, and suppresses fire primarily by heat absorption from the flame. Novec 1230 fluid offers an environmentally responsible option for fire suppression, having a zero ozone depletion potential (ODP), a global warming potential (GWP) of just one, and an atmospheric lifetime (ALT) of only five days. Novec 1230 does not fall under the European F-Gas Regulation, which imposes further control on minimising unwanted emission and registration of use, as it has a low GWP. The fluid mitigates the effect of an uncontrolled fire when used. The fluid can be readily recovered and recycled at the end of the lifetime of the system. Novec 1230 fluid does not damage sensitive equipment as it discharges as a colourless, electrically non-conductive and non-corrosive gas. This ensures that there is no post-discharge residue, resulting in no costly clean-up operations required and down-time is kept to a minimum. 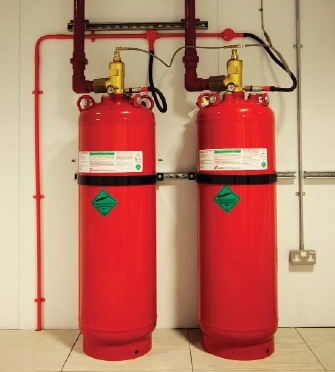 Kidde Fire Protection can offer a cost-effective Novec 1230 fire suppression system, by using its tried and trusted range of 25 bar equipment. It has been proven that fires can be put out quickly, before they can do any serious damage, following small and large-scale tests. Novec 1230 has been proven effective on a wide range of Class A, Class B and electrical fires. Extinguishing concentrations are met in less than ten seconds. The Novec 1230 fluid has been classified as acceptable for use as a total flooding agent in occupied spaces by the US EPA Significant New Alternatives Program (SNAP). A low design concentration of 4 to 6% in combination with a high No Observable Adverse Effect Level (NOAEL) of 10% means it provides a design concentration safety margin of up to 100%. This is by far the largest safety margin of any clean agent currently available. The Novec 1230 fluid does not act by oxygen depletion in the hazard zone. This means that there is no risk of human asphyxiation. 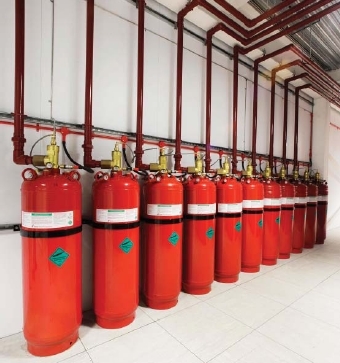 Novec 1230 fluid stored in steel cylinders connected to distribution pipework and specially designed discharge nozzles is what makes up the Kidde Fire Protection system. Novec 1230 fluid is stored as a liquid super-pressurised to 25 bar with nitrogen. Flexible system design is allowed with efficient transport and vapourisation of the Novec fluid. Compared to other viable gaseous agents, these systems have minimal storage space and weight requirements. Specially selected for use with Novec 1230 fluid, the range of cylinders, valves and related components have all been subjected to stringent testing procedures. Kidde Fire Protection is recognised as the world's finest in fire safety, with flexibility, quality and reliability the key factors in the company's success. Engineered systems are designed using FM Global and UL verified software and guidelines, and offer optimum designs for the defined risks with reduced pipe sizes, unbalanced flows and common room and void protection possible. Cylinder sizes are available in a wide choice of 5 to 368 litres are available, meeting specific requirements by offering a choice of fill capacities, also ensuring maximum economy in installation. Each cylinder is manufactured from high strength alloy steel and both TPED and DOT are available. Computer suites, EDP facilities, Telecommunications hardware, Internet service providers, Server rooms, Control rooms, Railway signalling centres, Stores and archives, Heritage sites, Museums, Art galleries, Medical and laboratory equipment, Libraries, Petrochemical plants, Power generation, Universities and colleges.